"Loosely based on the little red hen story, this tale features hard-working Iguana, who is preparing for a fiesta-with no help from her lazy friends, Turtle, Snake, and Rabbit. Brian and Rosi Amador's duet of pleasing voices introduces young listeners to some Spanish words. Rosi narrates and performs the part of Iguana, and Brian becomes the slow-voiced Turtle, perky Rabbit, and the regretful Snake. (Honest, he'd help more if he just had some arms!) Delicate guitar music plays softly in the background, creating the mood of the fiesta or the sound of a lullaby when tired Iguana finally rests. This pleasing production includes a glossary of the days of the week (she reads, he repeats, she defines), which allows youngsters to absorb a little Spanish." "A comical takeoff on the familiar Little Red Hen story, this upbeat read-along is brought vividly to life through Brian and Rosi Amador's tandem narration. There is so much to enjoy here: the familiar motif of three friends who can't be bothered to help industrious Iguana prepare for a fiesta, a southwestern desert setting, Spanish words sprinkled throughout, and a creative and positive ending. 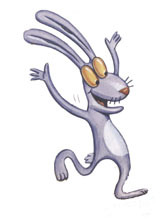 Three lazy friends, Conejo, Tortuga, and Culebra (Rabbit, Tortoise, and Snake), are voiced by Brian Amador, while the role of Iguana is read by Rosi Amador. The pitch-perfect pacing includes a reading of the glossary. The satisfying conclusion finds the three friends realizing why Iguana has shut them out of her fiesta; the triohelps clean up the party mess, and grateful Iguana shares leftovers with her reformed pals. Soft Latin background music is a lilting accompaniment. The price includes a hardcover book."